The new fleet means the Council won’t need to rely so much on hire vehicles, it will cut maintenance costs as well as reduce the amount of time trucks are off the road in the garage. Standardising the fleet means the garage can reduce its stock of spare parts. The new vehicles will have a rear steer capability and narrow chassis which allows for easier access to some areas of Plymouth where we had difficulties in some of the older fleet. The replacement programme – which will cost £4.2 million over two years – with achieve a saving of around £1 million over five years. Councillor Vincent added: “The technology for these vehicles is developing all the time and the new trucks will have the latest fuel efficiency technology and will be better for our carbon footprint.” The new fleet is part of the Council’s ongoing improvement package for its waste and recycling services. 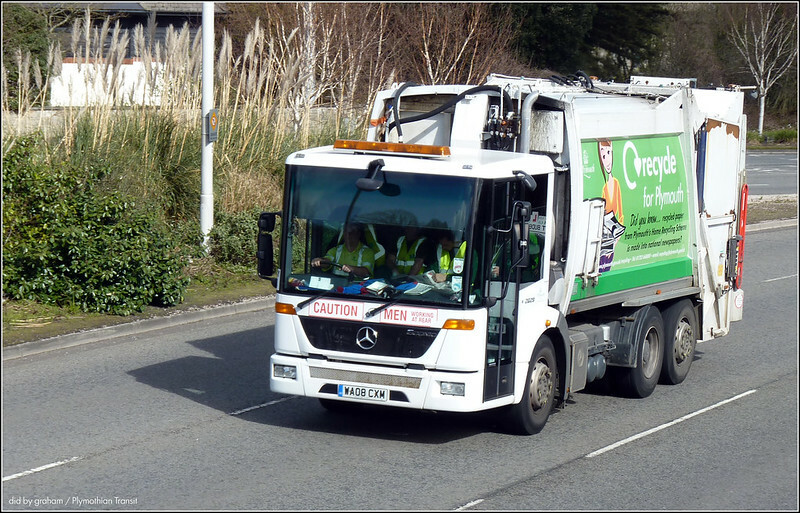 It has successfully introduced glass recycling into people’s door step recycling collection scheme – leading to an extra 898 tonnes of glass in a year. The Council has also upgraded its materials recycling facility at Chelson Meadow. The facility now allows for the separation of all the materials which are collected in green bin including glass. Speaking as a Dennis truck fan its nice to see the council back with them after the large batch of Mercedes trucks back in 2008. I have yet to see any if these new trucks yet but hopefully will have pics some time fairly soon. So which one's made in Guildford - the dustcarts or the buses?